Best Places to Run in Wilmington | NC Race Timing and Running Events | Go Time! If you are a trail runner looking for a relatively flat course, then this park is for you. 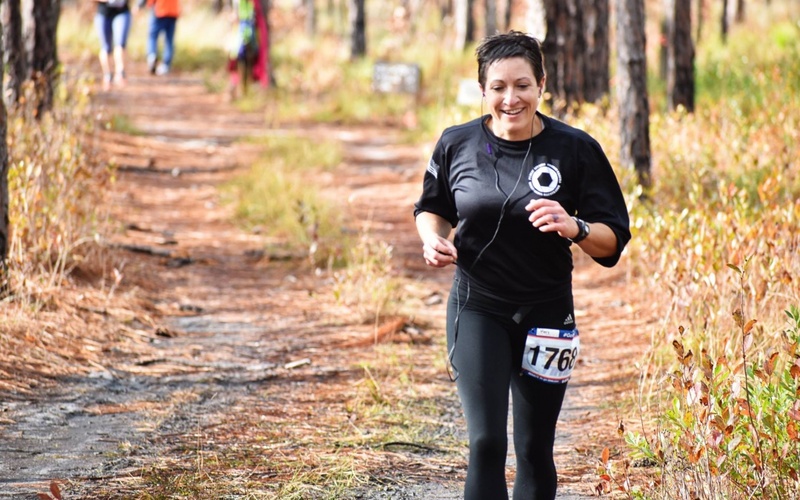 There are nearly 9 miles of trails throughout the state park, allowing runners to experience the vast plant and animal life, as well as views of the Cape Fear River. For shorter runs with a great view of the river and downtown, head to the Riverwalk in Downtown Wilmington. The riverwalk is 1.75 miles long, and is a nice chance of pace from a park or trail run. You can head off the riverwalk for extra mileage along stretches of beautiful historic homes. If you prefer a nice breeze and ocean views while running, then Fort Fisher is the place to go. Run along 6 miles of coastal beaches and trails while also taking in the sites of the aquarium, historic sites and the boating ramp. Getting a long run in without overlapping the same areas can be tricky. But this 15 mile pathway that stretches from the Heide-Trask Drawbridge in Wrightsville Beach to Wade Park is perfect for those who want to experience different views while on their runs. For a shady tree covering and a great views of the lake, head over to Greenfield Lake Park, just minutes from Downtown. The paved path around the lake is 4.8 miles, perfect for those looking to run a few loops for extra miles. Be on the lookout for gators while you are there! This park is a 1.3 mile shaded loop, and is made up of part of the Cross City Trail. Very little sun reaches the path on the loop, making it ideal for runs during the day, especially in the summer months. If you are looking to get away from the loop for part of your run, you can make your way to the Cross City Trail at either end of the park. For a larger loop inside a more open park, Hugh MacRae is a great option with a 1.55 mile outer loop, or even a shorter inner loop for beginner runners. This park is also mostly shaded and conveniently located near the intersection of Oleander Dr. & S College Rd. If you don’t mind little shade and a partial trail run experience, then exploring the still-growing River Lights community on your next run is a great option. Marina Village is the perfect place to park and start off your run before winding through the neighborhood on trails, viewing the river, water features and beautiful new homes. For runners who are comfortable creating their own course and looking to get away from a park setting, UNC Wilmington’s beautiful campus is a great place to run. A large stretch of the Cross City Trail goes through the East & South sides of campus, but there are also plenty of other sidewalks and pathways that can take you through the 660 acre campus. If you’re looking to get a nice ocean breeze, with out actually running on the beach, then The Loop at Wrightsville Beach is an ideal place to go. Runners can park at the Wrightsville Beach Park lot and then make their way around the 2.5 mile loop. The loop take you across two bridges that go over the Intracoastal Waterway, and through the streets of the quant little beach town.